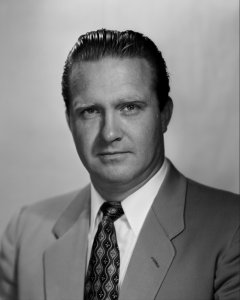 22 March 1948: Just over one year since being injured when the prototype P-80A was cut in half by a disintegrating turbojet engine, Lockheed test pilot Anthony W. (“Tony”) LeVier made the first flight of the prototype TP-80C-1-LO, serial number 48-356, a two-place jet trainer. 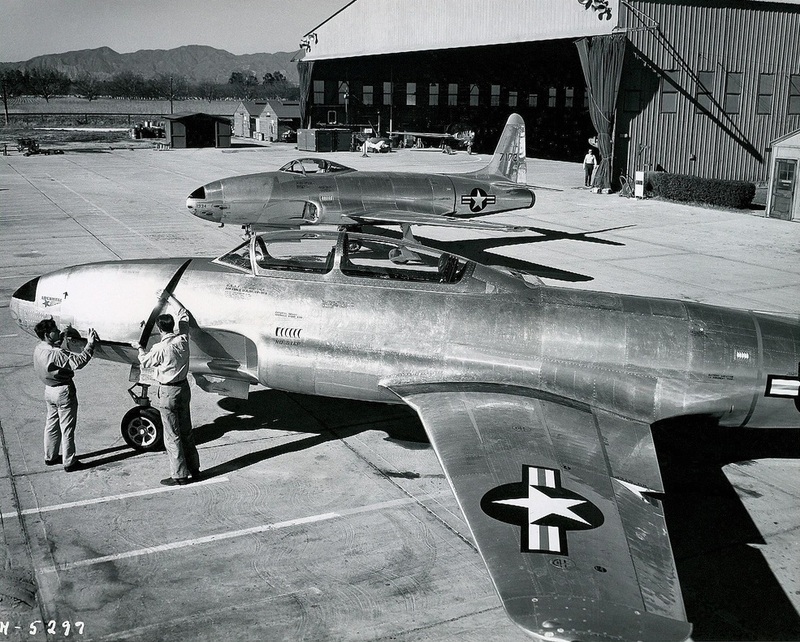 The airplane was redesignated TF-80C Shooting Star on 11 June 1948 and to T-33A, 5 May 1949. Adapted from a single-seat P-80C Shooting Star jet fighter, Lockheed engineers added 38.6 inches (0.980 meter) to the fuselage forward of the wing for a second cockpit, instrumentation and flight controls, and another 12 inches (0.305 meter) aft. 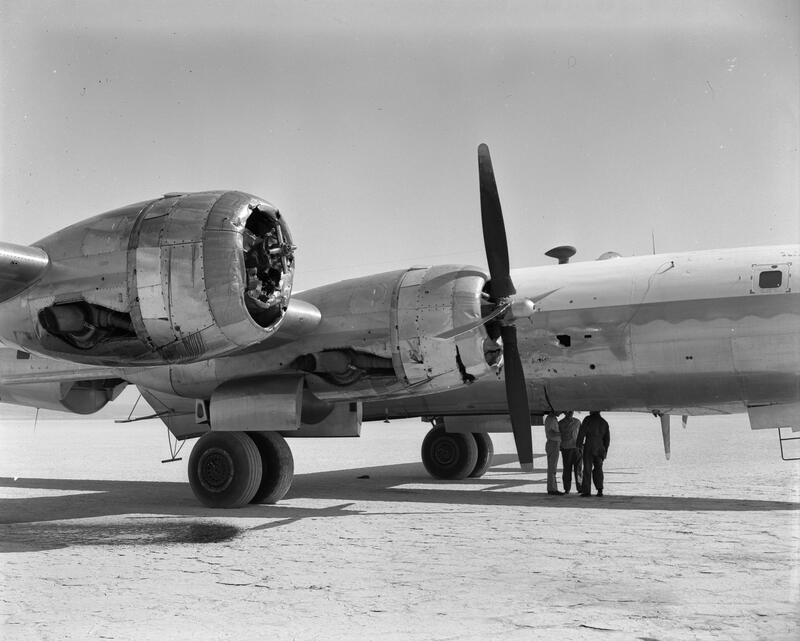 A more powerful engine, an Allison J33-A-23 with 4,600 pounds of thrust, helped offset the increased weight of the modified airplane. Internal fuel capacity decreased 72 gallons (273 liters) to 353 (1,336 liters). 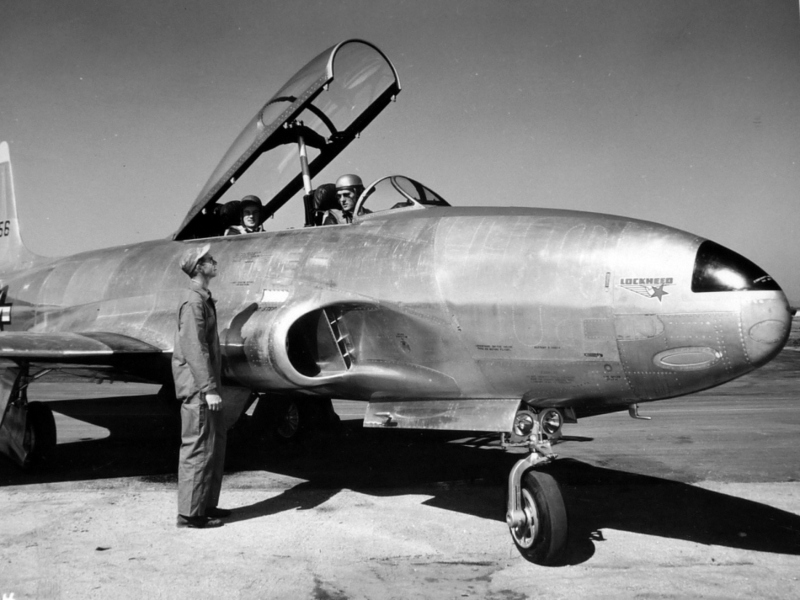 The Lockheed T-33A Shooting Star is 37.72 feet (11.50 meters) long, with a wingspan of 37.54 feet (11.44 meters), and overall height of 11.67 feet (3.56 meters). The wings a total area of 234.8 square feet (21.8 square meters). They have an angle of incidence of 1° with -1° 30′ of twist and 3° 49.8′ dihedral. The “T-Bird” has a basic weight of 9,637 pounds (4,371 kilograms), and gross weight of 15,280 pounds (6,931 kilograms). 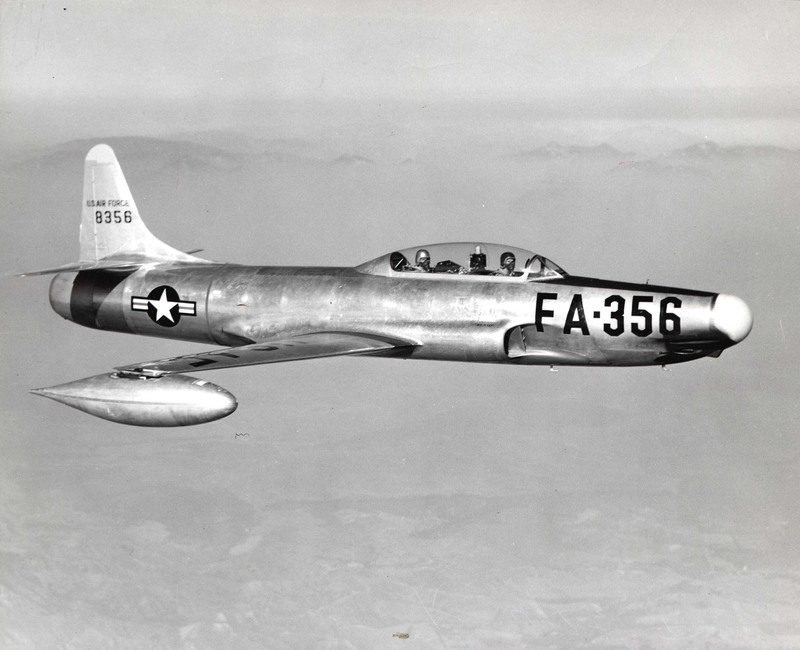 Originally produced with the J35-A-23 engine, the T-33 fleet was later standardized with the J35-A-35 engine. The J33 was a development of an earlier Frank Whittle-designed turbojet. It used a single-stage centrifugal-flow compressor, eleven combustion chambers and a single-stage axial-flow turbine section. The J33-A-35 had a Normal Power rating of 3,900 pounds of thrust (17.348 kilonewtons) at 11,250 r.p.m. (96%), and 4,600 pounds (20.462 kilonewtons) at 11,750 r.p.m. (100%). It was 107 inches (2.718 meters) long, 50.5 inches (1.283 meters) in diameter, and weighed 1,820 pounds (826 kilograms). 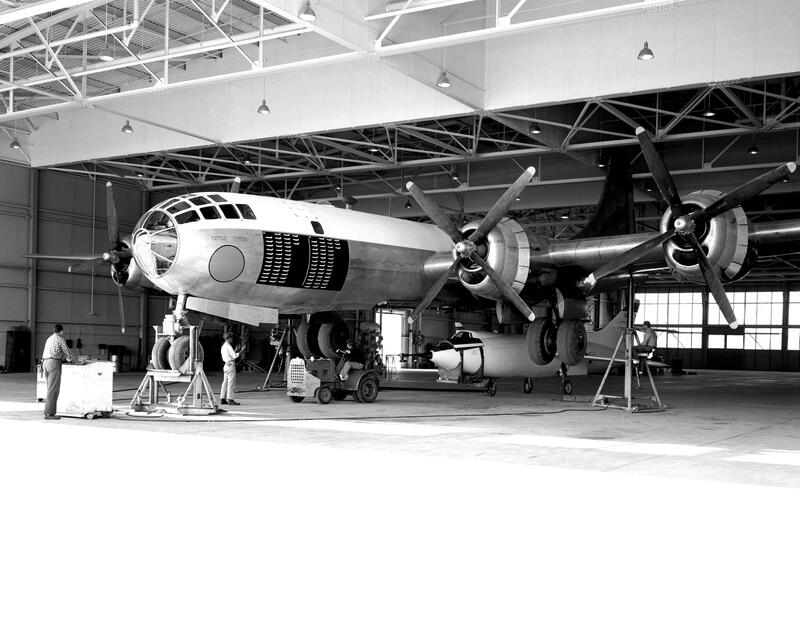 The engine was 16 feet, 3.5 inches (4.966 meters) long, 3 feet, 1.0 inches (0.940 meters) in diameter and weighed 2,830 pounds (1,284 kilograms). While the P-80 fighter was armed with six .50-caliber machine guns in the nose, the trainer was usually unarmed. Two machine guns could be installed for gunnery training. In production for 11 years, 5,691 T-33As were built by Lockheed, with licensed production of another 656 by Canadair Ltd., and 210 by Kawasaki Kokuki K.K. For over five decades, the “T-Bird” was used to train many tens of thousands of military pilots worldwide. TF-80C 48-356 was rebuilt as the prototype for Lockheed’s YF-94A interceptor, and then modified further to the F-94B. Sources have reported it as being stored at Edwards Air Force Base, California. 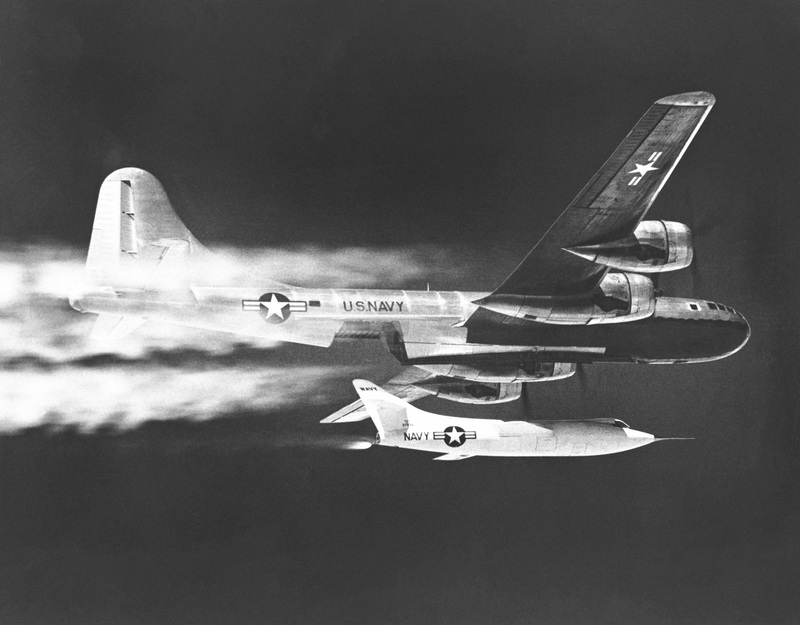 ¹ Specifications and performance data from T-33A PERFORMANCE EVALUATION, AFFTC-TR-61-22, May 1961, Air Force Flight Test Center, Edwards Air Force Base, California. The Project Pilot was Captain Thomas P. Stafford, U.S. Air Force. Stafford was next selected for the NASA Gemini Program, and flew Gemini 6A and Gemini 9. He commanded Apollo 10.